An apparatus, system and method are disclosed using a light source and sensor for a number of applications which an appropriate wavelength of the light source is selected depending upon the type of application, including corrosion assessment, sample quality assessment, water trace detection and explosive material detection. The present invention generally relates to a system and method for optically assessing (for example the quality of) a sample. In particular the present invention relates to a low cost, adaptable, multipurpose detection system for various applications. Many methods and systems have been developed over the last forty years that exploit electromagnetic properties of light for optical detections. However, the majority of the currently available instruments employ expensive laser technologies as a light source and most are generally fibre optic oriented. This makes the majority of the currently available instruments bulky and expensive to purchase and run. The price tag on currently available optical sensing devices is staggeringly high and the instruments are high maintenance. The currently available systems on the market are normally focused on a particular task and are not adaptable for other applications. The present invention seeks to provide a robust and low cost optical detector. Further, the invention disclosed herein has a unique core system with interchangeable probes, which are adaptable to numerous applications. The present invention generally relates to a system and method for optically assessing the quality of a sample. In particular the present invention relates to a low cost, adaptable, multipurpose detection system for various applications. According to an aspect there is provided a corrosion assessment system, comprising a light source for emitting radiation, a sensor for determining an intensity of the radiation reflected from and/or transmitted through the sample. According to a further aspect there is provided a corrosion assessment system, comprising a light emitting diode for emitting radiation having a wavelength between 300 and 2,500 nano-meters (nm), and a sensor for determining an intensity of the radiation reflected from and/or transmitted through the sample. According to a further aspect there is provided a portable system for assessing a quality of a sample, comprising a low powered light source for emitting radiation having a wavelength between 300 and 2,500 nanometers, and a sensor for determining an intensity of the radiation reflected from and/or transmitted through the sample. According to an aspect there is provided a photonic assessment system, comprising an LED for emitting light, and a sensor for determining an intensity of the light reflected from and/or transmitted through a subject. The system may further comprise a collimating means for focussing radiation. The system may be portable. The system may comprise an on-board power source, such as a battery. The light source, collimating means and sensor may all be independently inter-changeable. The light source may comprise a broad range of wavelengths between 300 nano-meters and 2,500 nano-meters (within the ultra-violet, visible and near-infra red spectrum). The light source may comprise a white Light Emitting Diode and the system may further comprise a rotatable prism for selection of the radiation wavelength. The light source may comprise one of: an array of Light Emitting Diodes; and a laser diode. The sensor may comprise a photodiode detector. The system may further comprise one or more of: a warning Light Emitting Diode; and an audible signal, for indicating when the radiation reaches a pre-determined threshold level. The collimating means may comprise a collimator. The collimator may be exchangeable for other collimators having various diameters and length sizes for diverging the radiation that is incident upon the sample (to improve detection). The system may further comprise a scan mechanism, for example for selecting a wavelength for the incident radiation. The system may further comprise a plurality of light sources, collimating means and sensors. The system may be operated with a voltage range between 5 and 15 Volts. The system may further comprise a USB connector for connection to an external USB port (for powering up and data communication). The system may further comprise a data acquisition module. The system may further comprise a telemetry module. According to a fourth aspect there is provided a corrosion assessment method, the method comprising providing a low powered light source that emits radiation having a wavelength between 300 and 2,500 nanometers, and determining an intensity of the radiation based upon radiation being reflected from or transmitted through the sample. According to a fifth aspect there is provided a method for assessing a quality of a sample, the method comprising providing a low powered light source that emits radiation having a wavelength between 300 and 2,500 nanometers, and determining an intensity of the radiation based upon radiation being reflected from or transmitted through the sample. The method may further comprise focussing the radiation through a collimating means. The condition of the sample may be assessed quickly based on interpretation of the amplitude spectra of the data acquired by one or all of the sensors. The method may further comprise detecting and locating an anomaly or change in the sample. The light source may comprise modulated light (sine-wave or square-wave) for compensating for any unwanted ambient light or any undesired variation using modulated light signal and a dedicated electronic circuitry. The method may further comprise an electronic switch for selection of a transmission mode or reflection mode. The radiation may correspond to wavelengths within the ultraviolet to near-infra red wavelength ranges. The radiation wavelength may be selected by switching within the arrays of LEDs, the LEDs having various wavelengths. The radiation wavelength may be selected by using a rotating prism through a small angular path to select any desired wavelength. The system may be operated in one of: a transmission mod; a reflection mode; and a combination of both transmission and reflection modes. The system may be adapted to have either single point scan or line (and area) scan mechanism. The system may be used to assess and characterise the surface of any reflective object by analysing the light reflection from the surface of the object. The method may comprise continually assessing the quality of the sample in real-time and providing a warning signal for indicating when the radiation reaches a pre-determined threshold level. The reflection mode may be used to assess and characterise the surface of the sample or underneath a surface coating of the sample based on the light source operating in the near-infra red wavelength range (i.e. rust detection underneath of the coating). e reflection mode may be used to detect rust, an impurity or any other defect on a reflective (metallic) surface. The reflection mode may be used to monitor a colour shade for detecting discoloration on a reflective (metallic) surface. The system may be used to interrogate and assess oil quality by determining their precise colour or evaluating any floating particles in the oil. The transmission mode may be used to assess and interrogate a condition of a gas and/or a liquid. The reflection mode may be used to detect cancer tissue that has been doped with dye and which fluoresces when illuminated by near infra-red wavelengths of radiation. The method may comprise detecting an ultraviolet dye or a near-infra red dye (as a marker) on any surface or underneath of any soft tissues when illuminated with a particular wavelength. 1. A compact optical Instrument for assessing the integrity and quality of a system by evaluating the radiant intensity that either reflects back or passes through that structure. Consequently the instrument is able to detect and locate any anomaly and changes in that system. 2. An optical detection system according to paragraph I where the device is low powered, and can be operated with various voltage ranges from 5 to 15 volts. 3. An optical detection system according to paragraph I can be connected to a PC via an USB port for powering up and data communication. 4. An optical detection system according to paragraph I can be battery powered, portable with data acquisition functionality and telemetry capability. 5. An optical detection system according to paragraph I wherein the source is a LED or a laser diode and have a broad range within the UV, visible and NIR spectrum. 6. An optical detection system according to paragraph I wherein the system can use modulated light (sine- wave or square-wave) as the radiation source. 7. An optical detection system according to paragraph I wherein the system compensates for any unwanted ambient light or any undesired variation using modulated light signal and a dedicated electronic circuitry. 8. An optical detection system according to paragraph I wherein the system uses exchangeable collimators with various diameters and length size to diverge the radiation for improved detection. 9. An optical detection system according to paragraph I that can be operated in transmission mode, reflection mode or the combination of the both modes. 10. An optical detection system according to paragraph I wherein the system can be switched between transmission or reflection mode by replacing the probe and using electronic switch. 1 1. An optical detection system according to paragraph I wherein system can be adapted to have either single point scan or line (and area) scan mechanism. 12. A tailored system according to paragraph I wherein the specific light source spectrum can be selected within the UV to NIR range. I 3. An optical detection system according to paragraph I wherein the light source with specific wavelength can be selected by either switching within the arrays of LEDs with various wavelengths or using a rotating prism through a small angular path to select any desired wavelength. 14. An optical detection system according to paragraph I wherein the system can be used to assess and characterise the surface of any reflective object by analysing the light reflection from the surface of the object. 15. An optical detection system according to paragraph I wherein the system is equipped with a warning led and an audible signal whenever the light output reach to the predetermined threshold level. 18. An optical detection system according to paragraph I wherein the system can be used to detect a UV dye or a NIR dye (as a marker) on any surface or underneath of any soft tissues when illuminated with particular wavelength. 19. An optical detection system according to paragraph I wherein the system in the reflection mode can detect rust, impurity or any defect on a reflective surface. 20. An optical detection system according to paragraph I wherein the system in the reflection mode can monitor the colour shades and detect discoloration on a reflective surface. 21. An optical detection system according to paragraph I wherein the system in the transmission mode can be used to assess and interrogate the gas and liquid condition. 22. An optical detection system according to paragraph I wherein the same system can be used to interrogate and assess the oil quality by determining their precise colour or evaluating any floating particles in the oil. 23. A system according to paragraph I wherein the condition of the sample can be assessed quickly from interpretation of the amplitude spectra of the data acquired by one or all of the sensors. A further aspect of the present invention relates to photonic detection of water trace in Kerosene, Gasoline, Jet fuels, Diesel fuels, Motor oils, Lubricating oil, Transformer oil, Hydraulic fluid and Crude oils. Water can enter fuel (such as kerosene, paraffin, petrol, diesel) systems and oil storage systems and sumps, either due to ingress or condensation. The presence of water in fuel systems, such as aircraft is potentially very dangerous. An aircraft pilot may think that he has sufficient fuel for a mission, but a fraction of the liquid in these fuel tanks may be water. Once the kerosene fuel has been used, the water can enter the fuel distribution system and stop the engines working, with potentially catastrophic results. Similarly, water contaminating diesel and petrol fuel tanks can cause failure of the motor when the water enters the combustion chambers of the engine. Water presence in hydraulic systems, cooling systems and transmission systems can react with other products in the oils to form acids that will lead to corrosion, which in turn will damage the devices that are affected. It is important to detect the presence of water in fuels and oils so that remedial action can be taken. The presence of water can be detected within the aircraft, vehicle, or plant fuel tanks and internal distribution systems. It can also be detected in the fuel distribution storage tanks within airport facilities, for example, and during the process of filling aircraft and vehicle fuel tanks. An aspect of the present invention provides a water trace detection system comprising a light source for illuminating a liquid sample at an appropriate wavelength, and a sensor for measuring transmitted, reflected or fluoresced light. An aspect of the present invention provides a water trace detection system comprising one or more LED lamps at appropriate wavelengths for illuminating a liquid sample, and a sensor for measuring transmitted, reflected or fluoresced light intensity. The sensor may measure transmission of either visible or invisible light through the liquid. Alternatively or additionally the sensor may measure reflection of either visible or invisible light from the surface of the liquid. Alternatively or additionally the sensor may be configured to measure the presence of fluorescence emitted from an illuminated liquid. Invisible ultra-violet light may be used to illuminate the liquid. The intensity of the transmitted, reflected or fluoresced light may be used to distinguish in real time between water, fuel and oil. A further aspect provide an olive oil quality detection system comprising a light source for illuminating a sample of olive oil at an appropriate wavelength, and a sensor for measuring transmitted, reflected or fluoresced light. A further aspect relates to photonic detection of explosive material due to fluorescent properties of explosive materials under ultraviolet (UV) excitation. Standoff detection of explosive material has gained a great interest in recent years due to terrorist activities. There is a strong demand for development of a cost effective and reliable system to detect a substance in explosive vapours or gaseous samples. Excitation UV light in certain wavelengths, typically between 200-220nm such as 210 nm, between 250- 270nm such as 266 nm, between 350-360nm such as 355 nm and/or between 360- 370nm such as 365 nm (nm being used to denote nanometers), is absorbed by susceptible molecules in explosives vapours, like RDX and TNT, and subsequently cause them to emit light of longer wavelengths (fluorescent effect). The detection of the explosive vapours may be in real-time. The fluorescent emission can then be detected using a sensor such as a photo-detector. There is provided a cost effective and compact UV fluorescent light panel (when compared to the UV laser) as a powerful energy source to provide UV illumination of explosive materials. There are provided discrete, precision narrow-band optical filters that are deployed in selective excitation regions of interest. The potentially explosive vapours can be detected using the selection of UV excitation sources in certain wavelength, discrete narrow-band optical filters and the configured photonic apparatus disclosed herein. There is provided an explosive material detection system comprising one or more light sources at appropriate wavelengths for illuminating a gaseous sample, and a sensor for measuring transmitted, reflected or fluoresced light intensity. The one or more light sources may be LED lamps configured to emit ultra-violet light to illuminate the gaseous sample. The ultra-violet light may have wavelengths of 210 nm, 266 nm, 355 nm and/or 365 nm. The explosive material detection system may further comprise narrow-band optical filters. The system may be configured to measure the presence of fluorescence emitted from an illuminated gaseous sample. Transmitted, reflected or fluoresced light intensity through the gaseous sample may be measured by the sensor. The intensity of the transmitted, reflected or fluoresced light may be used to detect the presence of RDX and/or TNT. The sensor may be a photo-detector. A further aspect relates to a hand-held photonic pen-shaped probe that can be used for a number of different applications. In one embodiment the probe finds application in photonic analysis for manufacturing process control of washing powder, laundry detergent and fabric softener using discrete LEDs in reflection mode. Laundry detergents play a significant part in everyday life. Due to the steady increase of washing powder consumption and enormous market potential, there is an urgent need for a cost effective and fast, analytical technique for quality control in a production line. The technique must have the capability to identify main ingredients and discriminate counterfeit products. There is provided an apparatus comprising a pen-shaped probe comprising a body, a tip, a collimator and a photonic device. The photonic device may be configured to operate using a reflection mode. The pen-shaped probe may be a hand-held device. The tip may be cone-shaped and the collimator may be attached to the tip. The apparatus may further comprise operating electronics and a battery. The photonic device may comprise an array of light sources in a circular arrangement, wherein the circular arrangement of the array of light sources provides the same angle of separation between each adjacent light source to provide a uniform illumination distribution on a target sample. The light sources may be LEDs. The photonic device may further comprise a sensor in the centre of the circular arrangement of light sources. The sensor may be a photo-diode. The apparatus may further comprise a digital switch configured to operate each of the light sources individually or in combination with other LEDs. Each of the lights sources in the array may be configured to emit an appropriate wavelength for illuminating a target sample to provide a maximum absorption for a chosen substance in the target sample. The apparatus may be used in a counterfeit detection system and/or be used in a quality control application in order to discriminate a counterfeit product. The counterfeit product may be a laundry product or washing powder. Further particular and preferred aspects of the present invention are set out in the accompanying independent and dependent claims. Features of the dependent claims may be combined with the features of the independent claims as appropriate, and in combination other than those explicitly set out in the claims. Each aspect can be carried out independently of the other aspects or in combination with one or more of the other aspects. Figures 5A and 5B are block diagrams showing an overview of hardware design of the invention according to an embodiment. Example embodiments are described below in sufficient detail to enable those of ordinary skill in the art to embody and implement the systems and processes herein described. It is important to understand that embodiments can be provided in many alternate forms and should not be construed as limited to the examples set forth herein. Accordingly, while embodiments can be modified in various ways and take on various alternative forms, specific embodiments thereof are shown in the drawings and described in detail below as examples. There is no intent to limit to the particular forms disclosed. On the contrary, all modifications, equivalents, and alternatives falling within the scope of the appended claims should be included. Elements of the example embodiments are consistently denoted by the same reference numerals throughout the drawings and detailed description where appropriate. The terminology used herein to describe embodiments is not intended to limit the scope. The articles "a," "an," and "the" are singular in that they have a single referent, however the use of the singular form in the present document should not preclude the presence of more than one referent. In other words, elements referred to in the singular can number one or more, unless the context clearly indicates otherwise. It will be further understood that the terms "comprises," "comprising," "includes," and/or "including," when used herein, specify the presence of stated features, items, steps, operations, elements, and/or components, but do not preclude the presence or addition of one or more other features, items, steps, operations, elements, components, and/or groups thereof. Unless otherwise defined, all terms (including technical and scientific terms) used herein are to be interpreted as is customary in the art. It will be further understood that terms in common usage should also be interpreted as is customary in the relevant art and not in an idealized or overly formal sense unless expressly so defined herein. Whilst the invention is described herein using the term "optical", this term is intended to relate to a spectrum ranging across different wavelengths, for example the ultra-violet, visible and/or infra-red regions of the spectrum, and is not limited to only a visible region of the spectrum. The terms "optical" and "photonic" are used interchangeably throughout this description. In general, the present invention finds application in any optical detection application that uses transmission and/or reflection properties and a specific wavelength or combination of any wavelengths within the range of ultraviolet to near-infra red wavelengths. Disclosed herein is a multi-purpose, low cost apparatus for instantaneous detection of any anomaly or inconsistency of a system with warning functionality. The apparatus is in the form of a portable, battery-operated diagnostic instrument which utilises controlled modulated Light Emitting Diode(s) (LEDs) as the light source and photo-diode detectors as radiation receptors/detectors. Depending on the application, two types of configurations with appropriate probe set-up is realised, i.e. for each a transmission mode and a reflection mode. The core detection system described herein has inter-changeable probes, for example an inter-changeable light source(s), collimating means and sensor(s). For some applications, the detection system may be embodied as a hand-held, pen-shaped probe. Figures I A and I B show examples of the invention operating in a reflection mode for a solid sample and a liquid sample respectively. In reflection mode the light hits the sample or fluid sample surface and is reflected back to a photodiode positioned next to the light source. The light path in this mode is designed in the form of a "Y" which optionally includes a common collimator. A common collimator may be used for detection measurements of a solid sample but may be omitted where a fluid sample is used. Figures 2A and 2B show examples of the invention operating in a transmission mode for a solid sample and a liquid sample respectively. In transmission mode the light passes through the sample and then hits the photodiode detector in the other side of the sample. In both reflection mode and transmission mode, the light photons hit the top layer of the sensor or photodiode to generate an electric current that is proportional to the radiation intensity. A dedicated electronic circuit converts the current into a corresponding voltage and amplifies the signal to improve the signal to noise ratio and to compensate for any ambient variables. When the light with a specific wavelength is reflected back or passes through (is transmitted) the sample, the radiation intensity is reduced due to light scattering and absorption. The amount of the reduction is the key to assessing specific features and a condition of the sample. By using modulated light, the photo-diode instrument can compensate for ambient light. Any changes in sample condition alter the amount of light that hits the receptor or photo-diode and consequently changes the voltage value. By comparing the voltage with a pre-set voltage reference, the system can alert and/or warn the user of a change in sample condition by means of a buzzer or alarming light. The light source intensity, the desired wavelength, pre-set voltage reference and the mode of the operation can be altered easily on each individual application, by changing the settings on the instrument or detection system. An optional data logging scheme can send the data to a main frame wirelessly on real time for more processing and data analysing. The system uses a modulate light to compensate for the ambient light. When the light source is on, the response on the sensor or receptor is the sum of the ambient light and the light source. When the light source is off, the receptor only registers the ambient response. By subtracting the two values from each other, only the information from the light source can be obtained. The instrument is capable of using arrays of LEDs or laser diodes (application dependant) within the broad band of spectrum ranging around 300 nm to 2,500nm which covers UV and NIR region. A combination of a white LED and a rotating prism can also provide the discrete wavelength as the light energy source. In order to improve the spatial resolution of the system a collimator with different diameters and lengths can be added to the instrument with an easy push and pull mechanism. A collimator can provide a more directional and narrower beam with higher resolution in specific applications. The optical detection apparatus, system and method described herein have applications in a number of industries. There detection techniques described herein provide the option to either (I ) use 'standard' colours to provide a colour fingerprint of the subject or target sample, or (2) select specific wavelengths that interact with the chemistry of the subject or sample to reflect, absorb or fluoresce a light response that can be measured. Some example applications and wavelengths for a light source and sensor are described in more detail below. 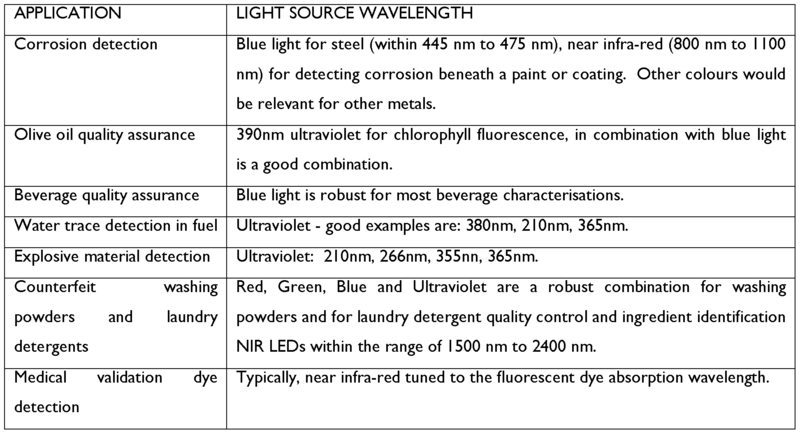 The table below gives some indication of the colours that are useful for different types of application, but is not exhaustive for any of the applications. One application for this system is continuous monitoring of a pipe line for early signs of corrosion. Corrosion on pipe joints produces a brown/reddish colour on the surface (i.e. rust). By choosing a blue LED light source and reflection mode on the instrument, the absorption of the blue light on the rusty surface would be significant and this could trigger an alarming system (e.g. an audible signal and/or a red light) for early detection. By selecting a Near Infra-Red (NIR) source, the instrument is capable of detecting the rust underneath of paint and plastic coatings. Another application for the system in transmission mode is a low cost approach for continuous oil degradation monitoring for transformer oil. The instrument can detect immediately in real time any minute discoloration of the oil or existence of tiny particle and alarm the system. This approach can be expanded to the other oil type applications or for any fluid where its discoloration may affect its functionality and therefore degradation is needed to be identified. Some aspects and embodiments of the present invention use photonics to distinguish between water, fuels and oils. Water traces can be detected using either spectral characterisation obtained by either transmission of either visible or invisible light through a liquid (Figure 2B) or reflection of either visible or invisible light from the surface of a liquid (Figure I B). Fuels and oils often fluoresce, while water does not. A photonic system can, therefore, also be configured to measure the presence of fluorescence emitted from an illuminated liquid (Figures 3A and 3B). For example, invisible ultra-violet light can be used to illuminate the liquid, which would then re- radiate (fluoresce) visible light at a different wavelength. The present invention involves using LED lamps at appropriate wavelengths to illuminate the fuel, oil or water. The transmitted, reflected or fluoresced light intensity is measured using a photo-diode, the intensity of which is used to distinguish in real time between water, fuel and oil. Figures 3A and 3B show a photonic system operating in transmission mode and configured to measure the presence of fluorescence emitted from an illuminated liquid. The light source and photodiode are positioned perpendicularly to one another. Light from the light source is transmitted through an optional collimator to the fluid at the appropriate wavelength to cause excited fluid particles such that the fluid fluoresces and re-radiates light at a different wavelength. The re-radiated light is transmitted through the fluid to the photodiode through an optional collimator. The perpendicular arrangement ensures that the majority of light detected at the photodiode originates from the re-radiated/fluorescing light from the fluid as opposed to light originating from the light source which would otherwise flood the photodiode. The perpendicular arrangement of the light source and photodiode provides a higher detection signal to noise ratio. Another application for the system is in quality control along a production line and counterfeit product detection. In reflection mode, a light source or LED bulb can be selected to have an appropriate wavelength which provides maximum absorption for a specific substance in a target sample. In an embodiment, specific ingredients in washing powder can be detected and therefore a counterfeit product can be determined. Figure 4A shows a hand-held photonic pen-shaped probe. The pen-shaped probe may be deployed in conjunction with the photonic device in either reflection mode or transmission mode and therefore is suitable to a number of detection and analysis techniques. The probe has a unique core system with interchangeable probes or probe tips, which are adaptable to numerous applications. The probe includes at least one light source and a sensor. The at least one light source may be an LED or other light source means. The sensor may be a receptor, photo- detector, photo-diode or other optical detection means. In an embodiment the probe may be used with an interchangeable probe tip to operate in the reflection mode using both the at least one light source and the sensor. In another embodiment the probe may be used with an interchangeable probe tip to operate in the transmission mode using the at least one light source and where the sensor is redundant, for example the probe being used to illuminate a target sample for which light transmitted, reflected or fluoresced through the target sample is detected by a separate sensor. The interchangeable probe tip may be the same probe tip or a different probe tip as used for operation in the reflection mode. In yet another embodiment a probe tip having a perpendicular arrangement of a light source and sensor may be used to operate in the transmission mode in which light is emitted from the light source at a different location on the probe to where transmitted light is detected. The pen probe design comprises a solid steel body frame attached to a tip. As shown in Figures 4B and 4C, the cone-shaped tip consists of a photonic device in the form of multiple discrete LEDs (multi-LED collimator) in a circular arrangement and a single photodiode in the centre. The steel body frame can also be modified to house a battery and dedicated electronics for individual photonic applications. The LEDs are provided in a circular arrangement with the same angle of separation to provide a uniform illumination distribution on a target sample. A digital switch can turn on the LEDs bulbs sequentially. The LEDs may be operated one at a time. The LEDs may be operated in different combinations with two or more LEDs operated at any given time. The reflected light intensity from a target sample is reflected back to the probe and is measured by the photo-diode located on the centre. Each individual LED bulb has an appropriate wavelength which provides maximum absorption for a specific substance in the target sample. In an embodiment, specific ingredients in washing powder are detected and a counterfeit product can be detected. By using identical LEDs at specific wavelengths in the probe, one can significantly increase the radiant intensity on the target sample. This can dramatically increase the florescent effect on certain substances, for example ingredients in fabric softeners. There is hence provided a low cost and effective apparatus for quality control with the ability to identify main ingredients or substances within a target sample (such as washing powder) and discriminate counterfeit products from genuine products. Figures 5A and 5B show block diagrams summarising the functionality of apparatus formed in accordance with the present invention. The modulating circuitry can be used to vary the wavelength of the light source. For example a multicolour LED having a wide spectrum of wavelengths can allow the detector to be used in a dynamic range of applications. The modulating circuitry can set the appropriate wavelength of the light source for either reflection or transmission modes. The light source illuminates the sample and a photodiode detects light reflected or transmitted from/through the sample. The photodiode detects ambient light not originating from the light source. Circuitry can obtain signal separation from the ambient in order to increase the signal to noise ratio of light originating from the sample by removing ambient light detected at the photodiode. A comparator may be provided such that any detection above or below a reference signal will cause an alarm to be triggered, which may be a visual or audible signal to alert the user of the detection result. For example, a user can detect the presence of water in fuel where the user is notified of a positive detection of water in the fuel. This notification may be based on use of a reference signal relating to the expected level of fluorescence from a fuel without water, and where any change or significant drop in the level of fluorescence from the fuel signifies the presence of water in the fuel. The result of the detection may be displayed to the user via a data logger or telemetry option. The invention described herein provides a robust and low cost optical detector. Further, the invention disclosed herein has a unique core system with interchangeable probes, which are adaptable to numerous applications. Whilst the invention has been described using LEDs having a spectrum ranging around 300 nm to 2,500nm which covers the UV, visible and NIR regions, other modifications using LEDs having a spectrum extending outside of this range may also be envisaged, depending upon the particular application to which the photonic detection is applied. Alternative light sources, other than LEDs are possible that use a different spectrum of wavelengths extending outside of the spectrum range disclosed herein. Although illustrative embodiments of the invention have been disclosed in detail herein, with reference to the accompanying drawings, it is understood that the invention is not limited to the precise embodiments shown and that various changes and modifications can be effected therein by one skilled in the art without departing from the scope of the invention as defined by the appended claims and their equivalents. a light emitting diode for emitting radiation having a wavelength between 300 and 2,500 nanometers; and a sensor for determining an intensity of the radiation reflected from and/or transmitted through the sample. a sensor for determining an intensity of the radiation reflected from and/or transmitted through the sample. 3. A system according to any preceding claim, further comprising a collimating means for focussing radiation, and optionally wherein the collimating means is independently inter-changeable. 4. A system according to any preceding claim, wherein the system is portable. 5. A system according to any preceding claim, wherein the system further comprises a battery power source. 6. A system according to any preceding claim, wherein the light source or light emitting diode, and sensor are all independently inter-changeable. 7. A system according to any preceding claim, wherein the light source or light emitting diode comprises a broad range of wavelengths between 300 nano-meters and 2,500 nano-meters. 8. A system according to any preceding claim, wherein the light source or light emitting diode comprises a white Light Emitting Diode and the system further comprises a rotatable prism for selection of the radiation wavelength. 9. A system according to any preceding claim, wherein the light source or light emitting diode comprises one of: an array of Light Emitting Diodes; and a laser diode. 10. A system according to any preceding claim, wherein the sensor comprises a photodiode detector. I I . A system according to any preceding claim, the system further comprises one or more of: a warning Light Emitting Diode; and an audible signal, for indicating when the radiation reaches a pre-determined threshold level. 12. A system according to of claims 3- 1 1 , wherein the collimating means comprises a collimator. 1 3. A system according to any of claims 3- 12, wherein the collimator is exchangeable for other collimators having various diameters and length sizes for diverging the radiation that is incident upon the sample. 14. A system according to any preceding claim, further comprising a scan mechanism. 15. A system according to any preceding claim, further comprising a plurality of light sources, collimating means and sensors. 16. A system according to any preceding claim, wherein the system is operated with a voltage range between 5 and 15 volts. 17. A system according to any preceding claim, wherein the system further comprises a USB connector for connection to an external USB port. 18. A system according to any preceding claim, wherein the system further comprises a data acquisition module. using at least one sensor for determining an intensity of the radiation based upon radiation being reflected from or transmitted through the sample. 21. A method according to claim 20, further comprising focussing the radiation through a collimating means. 22. A method according to claim 20 or claim 21 , wherein a condition of the sample is assessed based on interpretation of the amplitude spectra of data acquired by at least one sensor. 23. A method according to any of claims 20-22, further comprising detecting and locating an anomaly or change in the sample. 24. A method according to any of claims 20-23, wherein the light source comprises modulated light for compensating for any unwanted ambient light or any undesired variation using modulated light signal and a dedicated electronic circuitry. 25. A method according to any of claims 20-24, wherein the method further comprises a switch for selection of a transmission mode or reflection mode. 26. A method according to any of claims 20-25, wherein the radiation corresponds to wavelengths within the ultraviolet to near-infra red wavelength ranges. 27. A method according to any of claims 20-26, wherein the radiation wavelength is selected by switching within the arrays of LEDs, the LEDs having various wavelengths. 28. A method according to any of claims 20-27, wherein the radiation wavelength is selected by using a rotating prism through a small angular path to select any desired wavelength. 29. A method according to any of claims 20-28, operated in one of: a transmission mode; a reflection mode; and a combination of both transmission and reflection modes. 30. A method according to any of claims 20-29, wherein the method is adapted for either single point scanning or line scanning or area mechanism scanning. 31. A method according to any of claims 20-30, wherein the method can be used to assess and characterise the surface of any reflective object by analysing the light reflection from the surface of the object. 32. A method according to any of claims 20-31 , continually assessing the quality of the sample in real-time and providing a warning signal for indicating when the radiation reaches a pre-determined threshold level. 33. A method according to any of claims 20-32, wherein the reflection mode is used to assess and characterise the surface of the sample or underneath a surface coating of the sample based on the light source operating in the near-infra red wavelength range. 34. A method according to any of claims 20-33, wherein the reflection mode is used to detect rust, an impurity or any other defect on a reflective surface. 35. A method according to any of claims 20-34, wherein the reflection mode is used to monitor a colour shade for detecting discoloration on a reflective surface. 36. A method according to any of claims 20-35, wherein the method is used to interrogate and assess oil quality by determining the precise colour of the oil or evaluating any floating particles in the oil. 37. A method according to any of claims 20-36, wherein a transmission mode is used to assess and interrogate a gas and/or liquid condition. 38. A method according to any of claims 20-37, wherein a reflection mode is used to detect cancer tissue that has been doped with dye and which fluoresces when illuminated by near infra-red wavelengths of radiation. 39. A method according to any of claims 20-38, wherein the method comprises detecting an ultraviolet dye or a near-infra red dye (as a marker) on any surface or underneath of any soft tissues when illuminated with a particular wavelength. 40. A water trace detection system comprising one or more LED lamps at appropriate wavelengths for illuminating a liquid sample, and a sensor for measuring transmitted, reflected or fluoresced light intensity. 41. A system as claimed in claim 40, in which the sensor measures transmission of either visible or invisible light through the liquid. 42. A system as claimed in claim 40, in which the sensor measures reflection of either visible or invisible light from the surface of the liquid. 43. A system as claimed in any of claims 40-42 and configured to measure the presence of fluorescence emitted from an illuminated liquid. 44. A system as claimed in any of claims 40-43, in which invisible ultra-violet light is used to illuminate the liquid. 45. A system as claimed in any of claims 40-44, wherein the sensor is a photo-diode. 46. A system as claimed in any of claims 40-45, in which the intensity of the transmitted, reflected or fluoresced light is used to distinguish in real time between water, fuel and oil. 47. A water trace detection system comprising a light source for illuminating a liquid sample at an appropriate wavelength, and a sensor for measuring transmitted, reflected or fluoresced light. 48. An olive oil quality detection system comprising a light source for illuminating a sample of olive oil at an appropriate wavelength, and a sensor for measuring transmitted, reflected or fluoresced light. 49. An explosive material detection system comprising one or more light sources at appropriate wavelengths for illuminating a gaseous sample, and a sensor for measuring transmitted, reflected or fluoresced light intensity. 50. A system as claimed in claim 49, in which the one or more light sources are LED lamps configured to emit ultra-violet light to illuminate the gaseous sample. 51. A system as claimed in claim 50, in which the ultra-violet light has wavelengths of 210 nm, 266 nm, 355 nm and/or 365 nm. 52. A system as claimed in any of claims 49-51 , further comprising at least one narrow-band optical filter. 53. A system as claimed in any of claims 49-52 and configured to measure the presence of fluorescence emitted from an illuminated gaseous sample. 54. A system as claimed in any of claims 49-53, in which the measured intensity of the transmitted, reflected or fluoresced light is used to detect the presence of RDX and/or TNT. 55. A system as claimed in any of claims 49-54, in which the sensor is a photo-detector. 56. An apparatus comprising a pen-shaped probe comprising a body, a tip, a collimator and a photonic device. 57. An apparatus as claimed in claim 57, wherein the photonic device is configured to operate using a reflection mode. 58. An apparatus as claimed in claim 56 or claim 57, wherein the pen-shaped probe is a hand-held device. 59. An apparatus as claimed in any of claims 56-58, wherein the tip is cone-shaped and the collimator is attached to the tip. 60. An apparatus as claimed in any of claims 56-59, further comprising operating electronics and a battery. 61. An apparatus as claimed in any of claims 56-60, wherein the photonic device comprises an array of light sources in a circular arrangement. 62. An apparatus as claimed in claim 61 , wherein the circular arrangement of the array of light sources provides the same angle of separation between each adjacent light source to provide a uniform illumination distribution on a target sample. 63. An apparatus as claimed in claim 61 or claim 62, wherein the light sources are LEDs. 64. An apparatus as claimed in any of claims 56-63, wherein the photonic device comprises a sensor in the centre of a circular arrangement of light sources. 65. An apparatus as claimed in claim 64, wherein the sensor is a photo-diode. 66. An apparatus as claimed in any of claims 56-65, further comprising a digital switch configured to operate each of the light sources individually or in combination with other LEDs. 67. An apparatus as claimed in any of claims 61 -66, wherein each of the light sources in the array is configured to emit an appropriate wavelength for illuminating a target sample to provide a maximum absorption for a chosen substance in a target sample. 68. An apparatus as claimed in claim 67, for use in a counterfeit detection system. 69. An apparatus as claimed in claim 67 or claim 68, for use in a quality control application in order to discriminate a counterfeit product. 70. An apparatus as claimed in claim 68 or claim 69, wherein a counterfeit product is a laundry product or washing powder. 71. A system substantially as hereinbefore described with reference to, and as shown in, the accompanying drawings. 72. A method substantially as hereinbefore described with reference to, and as shown in, the accompanying drawings. EP0318501A1 (en) 1989-06-07 Methods of discriminating between contaminated and uncontaminated containers.